Despite selecting DeShone Kizer in last April’s draft, Cleveland Browns coach Hue Jackson has been preaching the same thing when it comes to starting quarterback this offseason. From OTAs to the start of training camp, incumbent Cody Kessler has been penciled in at the top of the depth chart. This was due in part to his showing some potential in 2016, while also being a step ahead of Kizer and Brock Osweiler in terms of familiarity with Jackson’s playbook. It certainly seemed like fair practice, especially considering Kizer was viewed as raw while Osweiler is coming off a putrid season with the Houston Texans. Just a little over a week into training camp, the narrative has shifted. Suddenly, many are expecting Kizer to come from behind and win the starting gig. Part of this is due to the fact the rookie has taken great strides since being drafted, displaying a strong understanding of the playbook and showing off notable athleticism in camp. However, another reason Kizer is closing in on the starting job is, frankly, because Kessler is fumbling it away. Based on everything we’ve heard, the former USC Trojan is having a camp to forget. As a result, his position at the top of the depth chart has gotten incredibly tentative. To be fair, the consensus from those watching Cleveland’s practice sessions is the offense in general has underwhelmed. This isn’t all on Kessler, as the Browns’ limited amount of weapons is also a hindrance. That said, it’s been some time since we’ve heard anything along the lines of Kessler standing out among his competition. One of the primary concerns with the second-year QB is something he dealt with last season – his arm-strength leaves a lot to be desired. Kessler reportedly spent much of the offseason working on his mechanics and doing what he could to add muscle. However, per reports from camp, not much has changed. Whenever he’s under center, the offense appears limited based on his inability to put the ball downfield. Even worse, it seems as though every time Kessler runs a simulated drive, he ends up taking a couple sacks. Much of this is due to the fact he’s holding on to the ball way too long. It was tough to believe anyone was more excited about Cleveland’s offseason focus of revamping the offensive line than Kessler. Suffering multiple concussions last year, you had to believe he was looking forward to enjoying stronger protection in the pocket this time around. Of course, if you still hang on to the ball longer than necessary, even the stoutest O-line is going to crack under the pressure. It’s all combined to create an uninspiring camp for Kessler. He’s struggled to move the ball or, in some cases, even get rid of it. As a result, his hold on the starting role has been continually slipping away. Not helping matters is how quickly Kizer is developing. His superior arm strength has made Kessler’s throws look like lobs, while he’s also showing a better ability to move the first-team offense. Kessler is, however, benefiting from the fact Kizer still needs some polish, especially with his footwork. Should the rookie still be showing signs of struggle in this area through the preseason, the coaching staff may be hesitant to put him at the top of the depth chart. That said, if you’re Kessler, the hope was you’d be starting come Week 1 because you earned it, not because Kizer hasn’t yet taken it from you. The picture should start to clear up a bit more in next week’s preseason opener. 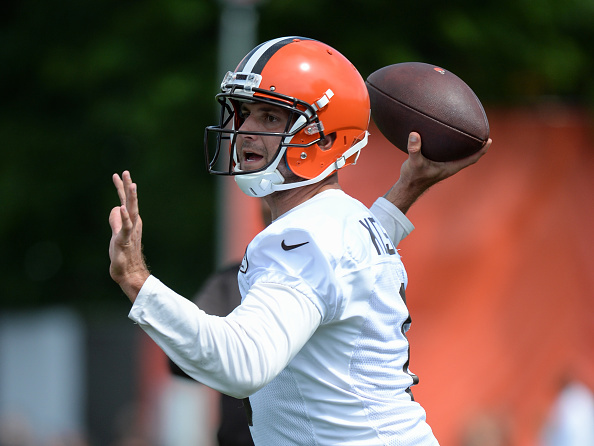 Should another underwhelming performance from Kessler be coupled with Kizer shining, we may start to see a shift in Cleveland’s QB depth chart. Unfortunately, the first week of camp has implied this is quite a likely scenario. Kessler put in a lot of work in the offseason with the hope it would help him stand out in camp. He certainly is, it’s just not for the reasons he was hoping to.